Jael's Art Jewels Blog: Fess up. You've got 'em, too. Fess up. You've got 'em, too. What you see in the picture are the latest discoveries in my quest for a simpler, clutter-free house. These were in my kitchen pantry/broom closet. They were going to be gifts. Yeah. That's it. Gifts. Another of my stories I'm sticking to. However... it's just the tip of the iceberg. Like Tribbles in The Trouble With Tribbles episode of the original Star Trek TV show, these soft, furry/fuzzy beanbags of cuteness fall from every closet, pop up in every box... I have two grown kids, and we all loved those things. Update- I've been cleaning, sorting, and ruthlessly giving away excess belongings, as those who have been following my blog already know. I now have a surprisingly close deadline: my mother is coming to live with us in a week, and my dad is following a couple of weeks later, along with the last three of their cats. Their furniture is coming, some of it anyway, too. At the moment the plan is to build on to our house, but it won't be done until late summer (won't start until April, at the earliest). Meanwhile mom and dad will be staying in the family room. So much to do! Don't EVER let your house get to the point mine is in!!! Take my situation as a fable, a lesson, a warning. Life is better uncluttered! 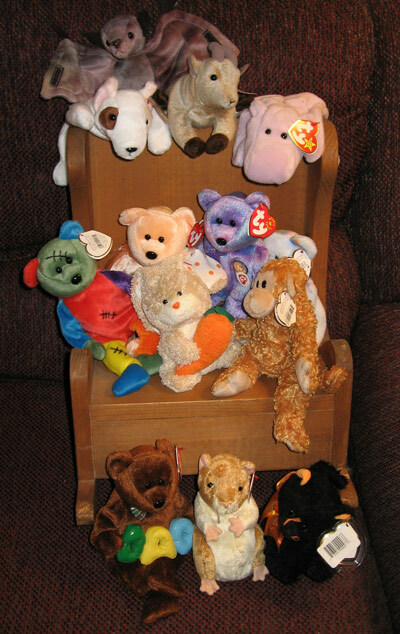 Heh, I had so many Beanie Babies, it isn't funny- my friends and I collected them when we were teenagers. I think most of them have been sold in yard sales or given away by now (unless they're still in my parents' basement? I dunno), but I still have a goat sitting on my computer monitor and a unicorn sitting by my window. But woah, ten bins full of fabric? I don't think I'd have been able to part with that! Well, those 10 bins are also only the tip of the iceberg.... I'm 50 and I've been collecting fabric since I was a teenager. Yes, my DH started collecting them with his sister, and got a little carried away. I've always loved stuffed animals, so it was hard to say no. We kept the bears and dogs, and have given away all the others! Yep, we had the Beanie Babies too. And we just donated them all as well. Sounds like you are getting through it all though! Keep at it, Jael. Clutter busting is SOOOO HARD for us packrats! When I moved from my house of 10 years, I gave away or trashed mountains of stuff. You might ask your local senior center or quilt guild if they could benefit from your fabric. Perhaps a church or youth group? This is one area I've been good. (Probably the only area) I have only two Beanie Babies...a unicorn and lop eared bunny since I collect both. For the rest, we gave away car loads of all kinds of stuff after our move from Illinois to Ohio (30 years accumulation) and we still have many boxes to clear from the basement. It's tough when there are two pack rats in the family. It is vey nice jewelry, I like it so much.